Lord of the Rings You Shall Not Pass Door Mat | Featuring the immortal lines You Shall Not Pass"!" It's your turn to take a stand! During Gandalf's epic battle with the Balrog on the bridge of Khazad-dǯm he utters those immortal lines, "You Shall Not Pass!". Now it's your turn to pass on the message to all those undesirables knocking at your front door. What a great "not-so-warming" housewarming gift for geeks! The silhouette of Gandalf will be enough to keep the Balrogs at bay, but for those who are welcome in your home, it functions just like a regular door mat, allowing your guests to brush the dirt off their feet, accumulated from their travels across Middle Earth. Pay tribute to one of your favourite movie franchises today! Officially licensed Lord of the Rings merchandise. Made made from 100% tough coconut brush with a non slip rubber backing. 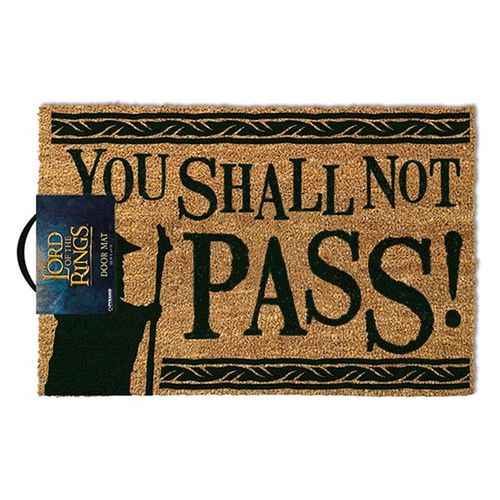 Standard Shipping: "Lord of the Rings You Shall Not Pass Door Mat" is unable to be delivered at our normal fixed price of $9.95 because of it's size and/or weight. There will be a small surcharge for freight on the checkout and free shipping will not be applied. Express Shipping: "Lord of the Rings You Shall Not Pass Door Mat" is unable to be express delivered at our normal fixed price of $14.95 because of it's size and/or weight.. If you need this item delivered fast the shipping cost will be calculated at actual cost at checkout.